Earlier this year, The New England Journal of Medicine published an article titled Randomized Trial of Introduction of Allergic Foods in Breast-Fed Infants”. The article is getting so much attention that it has earned a nickname, E.A.T. E.A.T. stands for Enquiring about Tolerance (ie tolerance to highly allergic foods). E.A.T. adds already increasing momentum that children should be fed younger than 6 months and should be fed highly allergic foods early. In this study, 1303 exclusively breast-fed infants were randomized into one of two groups. “The Standard-introduction Group” - one that was exclusively breast-fed until 6 months. “The Early-introduction Group” - one that was fed six highly allergic foods beginning at 3 months. The highly allergic foods studied were peanut, egg, milk, sesame, fish and wheat. They then observed the children for food allergies. Food allergies developed in 7.1% of children in the standard-introduction group and in 5.6% of children in the early introduction group. Thats right, introduction of highly allergic foods to 3-month-old breast-fed children was actually protective. When the researchers analyzed the data they actually only found it protective relative to peanut and egg allergies. There was no change found relative to the development of wheat, milk, sesame and fish allergies. The E.A.T. study comes on the heels of another landmark food allergy study from last year. L.E.A.P. (Learning Early About Peanut Allergy) or “Randomized Trial of Peanut Consumption in Infants at Risk for Peanut Allergy” was published in 2015. In this study, 640 infants who were high risk for food allergies were randomized to either avoid peanuts or be fed peanut products at least 3 times per week from 4 to 11 months until 5 years old. These researchers found weekly exposure to peanut products resulted in an 86% reduction of peanut allergy compared to peanut avoidance. Only ten years ago, experts recommended avoidance of highly allergic foods until older. Even today, leaders in the breastfeeding community argue for no solids in the first year of life. Sadly, these recommendations probably created many food allergic children. Given time, research should be able to define the “best” ages to introduce specific highly allergic foods. 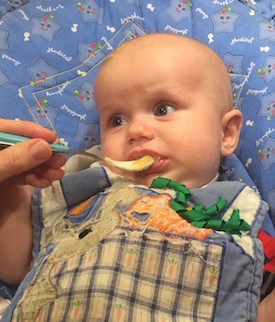 While, I have always recommended starting solids at 4 to 6 months of age, I’m beginning to push to start at 4 months. I still recommend starting with fruits and veggies, but who knows I soon may be recommend beginning with peanut butter omelettes (not really making my mouth water). For more information, please see my 4 month video or webpage starting solids. For a complete discussion see the 4 month section of Raising Good Parents.